In addition, it is also important to exclude other, more specific AML categories (ie, AML with myelodysplasia-related changes, therapy-related myeloid neoplasm, AML with germline predisposition, myeloid proliferations related to Down syndrome) before classifying as AML NOS. AML NOS comprises 30-40% of AML cases. In general, AML NOS is more common in adults, although it may occur in any age group. A diagnosis of AML requires the presence of least 20% leukemic cells in the bone marrow (BM) or peripheral blood (PB). It is important to recognize that promonocytes are considered blast equivalents for purposes of defining an AML. AML NOS may be subclassified further based on morphologic and cytochemical/immunophenotypic features that indicate the major lineages and degree of maturation: AML with minimal differentiation; AML without maturation; AML with maturation; acute myelomonocytic leukemia; acute monoblastic and monocytic leukemia; pure erythroid leukemia; acute megakaryoblastic leukemia; acute basophilic leukemia; and acute panmyelosis with myelofibrosis. Patients with acute myeloid leukemia (AML) with minimal differentiation, AML without differentiation, and AML with differentiation usually present with evidence of bone marrow failure (ie, anemia, neutropenia, and/or thrombocytopenia). Patients with acute myelomonocytic leukemia (AMML) also typically present with anemia and/or thrombocytopenia, but AMML is often associated with a monocytosis that may be composed of promonocytes, monoblasts, and mature monocytic cells; the later may predominant in the peripheral blood. Patients with acute monoblastic and monocytic leukemia may present with bleeding disorders, as well as with extramedullary masses, cutaneous and gingival infiltration, and central nervous system (CNS) involvement. Although patients with acute megakaryoblastic leukemia may present with evidence of bone marrow failure associated with pancytopenia, in some cases, thrombocytosis is present. Patients with acute basophilic leukemia often present with evidence of bone marrow failure, as is seen with the other types of AML described above; in addition, they may present with cutaneous involvement, organomegaly, lytic lesions, and symptoms related to hyperhistaminemia. Acute panmyelosis with myelofibrosis is associated with severe constitutional symptoms (ie, weakness, fatigue, fever, and bone pain) and, invariably, pancytopenia; the disease follows a rapidly progressive clinical course. In this section, the morphologic features of the subtypes of acute myeloid leukemia (AML) not otherwise categorized (NOS) are briefly discussed. AML-M0 cannot be diagnosed on morphologic grounds alone, because the blasts are of varying size and are agranular, sometimes resembling lymphoblasts (see the image below). Immunophenotyping is required to determine myeloid lineage. By definition, the blasts are MPO and Sudan Black B negative (<3% positive blasts). 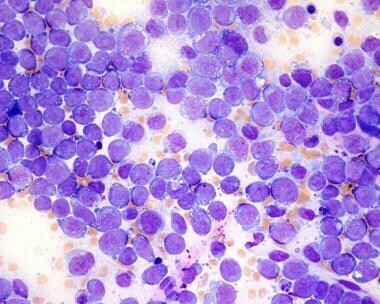 Blasts of acute myeloid leukemia, type M0. In AML without differentiation, the predominant blast type, representing more than 90% of the nonerythroid cells, is a poorly differentiated myeloblast with one or more distinctive nucleoli. The blast population, termed blast type I, consists of blasts without any recognizable granules. In blast type II, some blasts have a few fine, azurophilic granules (numbering <20). The presence of occasional Auer rods is consistent with the diagnosis of AML-M1. Because the blast population represents more than 90% of the cells, minimal differentiation is still present, but very few mature cells are found. AML with differentiation displays clear evidence of significant maturation, with abnormal differentiating cells ranging from promyelocytes to neutrophils. As defined by the World Health Organization (WHO) criteria, the percentage of blasts is at least 20% and less than 90%. The percentage of monocytic precursors must be below 20% in the bone marrow. In blast type III, more than 20 granules must be present, with a central nucleus, no Golgi zone, and a fine chromatin with the classic blast characteristics (ie, blast type I without granules, blast type II with <20 granules). In acute myelomonocytic leukemia (AMML), both granulocytic and monocytic precursors exist in varying proportions. For a diagnosis of AMML, the marrow monocytic component must account for 20% or more of the nonerythroid nucleated cells, but it cannot exceed 80%. The blasts cells show folded nuclei and some blasts may have cytoplasmic granules and Auer rods. 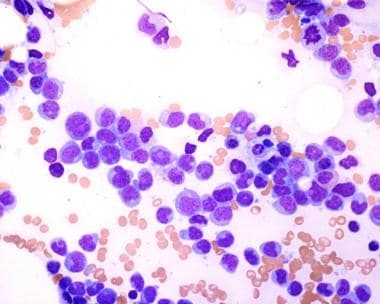 In acute monoblastic leukemia, the marrow is almost exclusively composed of immature monoblasts with less than 20% promonocytes or mature monocytes (see the following image). The blasts are large (≥30 mm), with an abundant rim of cytoplasm; rarely, azurophilic fine granules are present, and vacuolated basophilic cytoplasm is sometimes seen. The nucleus is round to oval, with delicate, lacy chromatin. 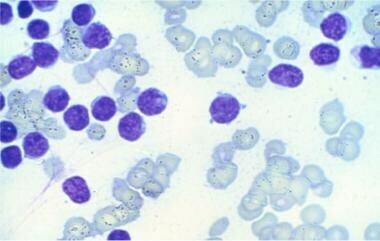 Blasts of acute myeloid leukemia, type M5a. In acute monocytic leukemia, at least 20% of the abnormal cells are recognizable promonocytes or beyond, with twisted or folded nuclei, gray-blue cytoplasm, and scattered azurophilic granules (see the image below). The percentage of mature monocytes is generally much higher in the peripheral blood than in the bone marrow. Rarely, a few blasts contain Auer rods. Morphology of acute myeloid leukemia, type M5b. Pure erythroid leukemia without morphologic evidence of erythroid maturation may be difficult to separate from other leukemias (lymphoblastic, megakaryoblastic, minimally differentiated) and immunophenotyping is essential for diagnosis. The differential diagnosis includes megaloblastic leukemia due to folate or vitamin B12 deficiency. Megakaryoblastic leukemia is a fulminant proliferative disease for which bone marrow biopsy is invaluable in establishing the diagnosis. The reason for this is that in only a few cases does the bone marrow aspirate show a significant (>20%) number of blasts. Frequently, the aspirates are very scant, owing to the marked myelofibrosis common in the disease. For these reasons, bone marrow biopsy specimens are needed. The sections may show many blasts or clusters of micromegakaryoblasts, as well as more mature megakaryoblasts. This is associated with an increase in the reticulin network and a corresponding decrease in the usual myeloid maturation. Megakaryoblastic fragments with changes in red blood cell morphologic structure and circulating small blasts, resembling either type I or type II blasts, may be found in the peripheral blood. The morphologic features of the blasts reveal cells that are pleomorphic; these cells may vary from very small forms with dense nuclear chromatin to large forms with 1-3 prominent nucleoli. Cytoplasmic blebs may be found surrounding some blasts. In more mature cells, such as circulating micromegakaryocytes, these expansions look like platelets. In pediatric acute megakaryoblastic leukemia, the bone marrow aspiration is much more easily performed; the blasts may resemble lymphoblasts, but cytoplasmic blebs may be identified, as depicted below. Megakaryoblasts from a pediatric case of acute megakaryoblastic leukemia. 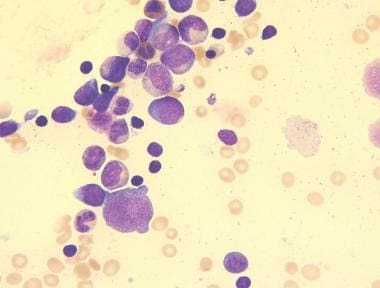 In acute basophilic leukemia, the blasts are characterized by moderately basophilic cytoplasm and a variable number of coarse basophilic granules. Mature basophils are sparse. Acute panmyelosis with myelofibrosis is characterized by pancytopenia; leukoerythroblastosis may be evident in the peripheral blood. On bone marrow biopsy, hypercellularity with variable hyperplasia of erythroid precursors, granulocytes, and megakaryocytes is evident. There are foci of immature cells, including blasts, clusters of late-stage erythroid precursors, and increased dysplastic megakaryocytes associated with marked reticulin fibrosis. The marked fibrosis usually results in a "dry tap" upon aspiration. AML with minimal differentiation is characterized by negative myeloperoxidase (MPO) and Sudan black B reaction (results are positive in <3% of blasts). In AML without maturation, more than 3% of blasts are positive on MPO or Sudan black B staining. Occasionally, the specific esterase stain for granulocyte precursors (ie, naphthol ASD chloroacetate esterase [CAE]) is positive when the MPO is negative. AML with maturation demonstrates blasts with strong MPO positivity. The nonspecific esterase reactions (ie, alpha naphthyl acetate esterase [ANAE] and alpha naphthyl butyrate esterase [ANBE]) cannot identify more than 20% of monocyte precursors of the nonerythroid component of the bone marrow. Acute myelomonocytic leukemia (AMML) demonstrates more than 20% monocytic precursors of the nonerythroid component of the bone marrow by ANAE and/or ANBE staining and over 20% myeloid precursors by differential count and/or by MPO staining of the nonerythroid component of the bone marrow. In acute monoblastic and acute monocytic leukemias (AMoLs), nonspecific esterase staining (ie, ANAE and/or ANBE), causes a strong positive reaction in more than 80% of the nonerythroid component of the bone marrow in over 90% of cases. Occasionally, the Sudan black B reaction is positive in the absence of an MPO reaction. It should be kept in mind that the blasts of AMoL may show fine, granular staining with CAE. However, AMoLs are characterized by less than 20% myeloid precursors of the nonerythroid component of the bone marrow, primarily as determined on the basis of the differential count, because promonocytes may show some scattered MPO positivity. Flow cytometric immunophenotyping (FCI) distinguishes AML from precursor B-cell and precursor T-cell lymphoblastic leukemias. FCI defines AML with minimal differentiation, which requires expression of myelomonocytic markers (ie, CD13, CD33) by flow cytometric analysis. There is no expression of intracytoplasmic MPO, CD3, or lineage-specific B-cell markers. FCI may be useful in distinguishing the hypogranular variant of acute promyelocytic leukemia from acute monocytic leukemia. By FCI, both the classic (hypergranular) and microgranular or hypogranular variants of acute promyelocytic leukemia uniformly lack expression of CD14; they typically lack expression of HLA-Dr, CD34, and CD56; and they may have dim expression of CD64 and CD117. By contrast, AMoL uniformly expresses HLA-Dr; it often expresses CD56 and CD64; it may express CD34; and it variably expresses CD117. In addition, one should keep in mind that although CD14 is a monocyte-specific marker, CD14 is often absent or is frequently diminished in expression in AMLs with monocytic differentiation (ie, AMML and AMoL). In addition, other markers characteristically expressed by normal monocytic cells (ie, CD11b, CD13, CD15, CD33, and CD64) may be absent or at least partially diminished in AMML and AMoL. CD56 may be aberrantly expressed in up to 50% of cases of AMML and AMoL. Detection of CD34 and CD117 expression by FCI has also been shown to be indicative of malignancy in monocytic disorders; thus, such expression may be observed in AMML and AMoL. In one study, the combination of any degree of CD64 expression with CD15 expression of 3+ intensity and heterogeneous CD13 expression or CD13 expression of 1+ to 2+ intensity was observed only in the AMML and AMoL subtypes. Although FCI is the preferred method of immunophenotypically differentiating acute leukemias, paraffin IHC staining may be useful in situations in which it is not possible to perform FCI. For example, when a bone marrow aspirate is markedly hemodiluted or cannot be obtained, bone marrow sections may be the only evaluable means to establish a diagnosis of myelodysplastic syndrome (MDS) or AML, as well as to distinguish these two entities from each other and from other possible hematolymphoid malignancies. As mentioned earlier, it is important to interpret stains in light of other immunophenotypic markers (ie, an IHC panel) and in combination with the morphologic features of each case. There are IHC markers for some of those antigens typically analyzed by FCI that may be employed on bone marrow sections to detect immature cells (ie, CD34, CD117, and TdT), to detect monocytic cells (ie, CD14), to distinguish erythroid from myeloid precursors (ie, CD33, MPO, and e-cadherin and glycophorin A), and to detect megakaryoblasts (CD41 and CD61). FCI and IHC are equally sensitive to the detection of CD34. IHC staining appears to be significantly more reliable in detecting CD34 than CD117. Nevertheless, in combination, they are most reliable and are complementary for accurately quantifying blasts. These methods should be performed on both bone clots and cores, owing to their variable reactivity in paraffin-embedded and decalcified tissues. It is also important to remember that not all myeloblasts express CD34 and/or CD117. TdT may be detected by flow cytometry as well as IHC staining. Flow cytometry has been shown to be very sensitive and can detect as few as 2% blasts; flow cytometry also allows for multicolor analysis to confirm the presence of TdT on T-cells, B-cells, and myeloid cells. In contrast, TdT IHC staining does not necessarily correlate with the percentage of blasts in AML. This lack of significant correlation results from the fact that cells that are positive for TdT on IHC staining of bone marrow tissue specimens most likely represent some myeloblasts that express TdT (given that TdT is a marker of immaturity and is not lineage specific), as well as other immature cells in the bone marrow, such as hematogones. The molecular or genetic abnormalities detected in patients with acute myeloid leukemia (AML) who have a normal karyotype may be arbitrarily divided into two major groups: (1) abnormalities directly affecting the proliferation and apoptosis of leukemia cells, and (2) abnormalities affecting the proliferation and apoptosis of leukemia cells through interaction with bone marrow stroma. This discussion is restricted to a subset of the abnormalities directly affecting the proliferation and apoptosis of leukemia cells, namely FLT3 gene mutations and NPM1 gene mutations. Several large-scale studies have demonstrated the impact of FLT3 mutations on patients' clinical outcomes. [34, 45] FLT3/ITD mutations have been found to be a strong adverse predictive factor for overall survival, disease-free survival, and event-free survival within the intermediate-risk cytogenetic category. The NPM1 gene is located at band 5q35 and contains 12 exons. [46, 47] NPM1 encodes three alternatively spliced nucleophosmin (NPM) isoforms: B23.1, B23.2, and B23.3. NPM is a highly conserved phosphoprotein that is ubiquitously expressed in tissues. [46, 47] Although the bulk of NPM resides in the granular region of the nucleolus, it shuttles continuously between the nucleus and the cytoplasm. [46, 47, 48] Except for two cases involving splicing the donor site of NPM1 in exon 9 or exon 11,  all reported NPM1 mutations occur in exon 12. They typically result in an elongation of the NPM protein remaining in the cytoplasm; this change is relatively specific for AML, whereas almost all other human neoplasms consistently show nucleus-restricted NPM expression. NPM1 mutations are characteristically heterozygous and retain a wild-type allele. NPM1 functions both as an oncogene and a tumor-suppressor gene, depending on the gene dosage, expression levels, interacting partners, and compartmentalization. NPM plays a central role in cell growth and proliferation through its involvement in ribosome biogenesis. Its expression increases in response to mitogenic stimuli, and above-normal amounts are detected in highly proliferating and malignant cells. However, NPM1 contributes to growth-suppressing pathways through its interaction with the alternate reading frame (ARF). Bone marrow biopsy specimens from patients with AML that is associated with NPM1 mutations frequently show an increase in the number of megakaryocytes that exhibit dysplastic features. After induction therapy, patients with AML who have a normal karyotype but who carry NPM1 mutations achieve higher rates of complete remission than similar patients who do not harbor an NPM1 mutation. A summary of the clinical relevance of genetic abnormalities is outlined below. Arber DA, Orazi A, Hasserjian R, et al. The 2016 revision to the World Health Organization classification of myeloid neoplasms and acute leukemia. Blood. 2016 May 19. 127(20):2391-405. [Medline]. [Full Text]. Dunphy CH. Applications of flow cytometry and immunohistochemistry to diagnostic hematopathology. Arch Pathol Lab Med. 2004 Sep. 128(9):1004-22. [Medline]. Dunphy CH, Orton SO, Mantell J. Relative contributions of enzyme cytochemistry and flow cytometric immunophenotyping to the evaluation of acute myeloid leukemias with a monocytic component and of flow cytometric immunophenotyping to the evaluation of absolute monocytoses. Am J Clin Pathol. 2004 Dec. 122(6):865-74. [Medline]. Gassmann W, Loffler H. Acute megakaryoblastic leukemia. Leuk Lymphoma. 1995. 18 Suppl 1:69-73. [Medline]. Kafer G, Willer A, Ludwig W, Kramer A, Hehlmann R, Hastka J. Intracellular expression of CD61 precedes surface expression. Ann Hematol. 1999 Oct. 78(10):472-4. [Medline]. Karandikar NJ, Aquino DB, McKenna RW, Kroft SH. Transient myeloproliferative disorder and acute myeloid leukemia in Down syndrome. An immunophenotypic analysis. Am J Clin Pathol. 2001 Aug. 116(2):204-10. [Medline]. Almasri NM, Iturraspe JA, Benson NA, Chen MG, Braylan RC. Flow cytometric analysis of terminal deoxynucleotidyl transferase. Am J Clin Pathol. 1991 Mar. 95(3):376-80. [Medline]. Dunphy CH, O'Malley DP, Perkins SL, Chang CC. Analysis of immunohistochemical markers in bone marrow sections to evaluate for myelodysplastic syndromes and acute myeloid leukemias. Appl Immunohistochem Mol Morphol. 2007 Jun. 15(2):154-9. [Medline]. Lyman SD, James L, Zappone J, Sleath PR, Beckmann MP, Bird T. Characterization of the protein encoded by the flt3 (flk2) receptor-like tyrosine kinase gene. Oncogene. 1993 Apr. 8(4):815-22. [Medline]. Abu-Duhier FM, Goodeve AC, Wilson GA, Care RS, Peake IR, Reilly JT. Genomic structure of human FLT3: implications for mutational analysis. Br J Haematol. 2001 Jun. 113(4):1076-7. [Medline]. Lyman SD. Biology of flt3 ligand and receptor. Int J Hematol. 1995 Aug. 62(2):63-73. [Medline]. Rosnet O, Buhring HJ, deLapeyriere O, et al. Expression and signal transduction of the FLT3 tyrosine kinase receptor. Acta Haematol. 1996. 95(3-4):218-23. [Medline]. Hannum C, Culpepper J, Campbell D, et al. Ligand for FLT3/FLK2 receptor tyrosine kinase regulates growth of haematopoietic stem cells and is encoded by variant RNAs. Nature. 1994 Apr 14. 368(6472):643-8. [Medline]. McKenna HJ, Smith FO, Brasel K, et al. Effects of flt3 ligand on acute myeloid and lymphocytic leukemic blast cells from children. Exp Hematol. 1996 Feb. 24(2):378-85. [Medline]. Rusten LS, Lyman SD, Veiby OP, Jacobsen SE. The FLT3 ligand is a direct and potent stimulator of the growth of primitive and committed human CD34+ bone marrow progenitor cells in vitro. Blood. 1996 Feb 15. 87(4):1317-25. [Medline]. Lyman SD, Jacobsen SE. c-kit ligand and Flt3 ligand: stem/progenitor cell factors with overlapping yet distinct activities. Blood. 1998 Feb 15. 91(4):1101-34. [Medline]. Drexler HG. Expression of FLT3 receptor and response to FLT3 ligand by leukemic cells. Leukemia. 1996 Apr. 10(4):588-99. [Medline]. Drexler HG, Meyer C, Quentmeier H. Effects of FLT3 ligand on proliferation and survival of myeloid leukemia cells. Leuk Lymphoma. 1999 Mar. 33(1-2):83-91. [Medline]. Rosnet O, Buhring HJ, Marchetto S, et al. Human FLT3/FLK2 receptor tyrosine kinase is expressed at the surface of normal and malignant hematopoietic cells. Leukemia. 1996 Feb. 10(2):238-48. [Medline]. Nakao M, Yokota S, Iwai T, et al. Internal tandem duplication of the flt3 gene found in acute myeloid leukemia. Leukemia. 1996 Dec. 10(12):1911-8. [Medline]. Yamamoto Y, Kiyoi H, Nakano Y, et al. Activating mutation of D835 within the activation loop of FLT3 in human hematologic malignancies. Blood. 2001 Apr 15. 97(8):2434-9. [Medline]. Abu-Duhier FM, Goodeve AC, Wilson GA, Care RS, Peake IR, Reilly JT. Identification of novel FLT-3 Asp835 mutations in adult acute myeloid leukaemia. Br J Haematol. 2001 Jun. 113(4):983-8. [Medline]. Stirewalt DL, Kopecky KJ, Meshinchi S, et al. FLT3, RAS, and TP53 mutations in elderly patients with acute myeloid leukemia. Blood. 2001 Jun 1. 97(11):3589-95. [Medline]. Thiede C, Steudel C, Mohr B, et al. Analysis of FLT3-activating mutations in 979 patients with acute myelogenous leukemia: association with FAB subtypes and identification of subgroups with poor prognosis. Blood. 2002 Jun 15. 99(12):4326-35. [Medline]. Spiekermann K, Bagrintseva K, Schoch C, Haferlach T, Hiddemann W, Schnittger S. A new and recurrent activating length mutation in exon 20 of the FLT3 gene in acute myeloid leukemia. Blood. 2002 Nov 1. 100(9):3423-5. [Medline]. Kindler T, Breitenbuecher F, Kasper S, et al. Identification of a novel activating mutation (Y842C) within the activation loop of FLT3 in patients with acute myeloid leukemia (AML). Blood. 2005 Jan 1. 105(1):335-40. [Medline]. Taketani T, Taki T, Sugita K, et al. FLT3 mutations in the activation loop of tyrosine kinase domain are frequently found in infant ALL with MLL rearrangements and pediatric ALL with hyperdiploidy. Blood. 2004 Feb 1. 103(3):1085-8. [Medline]. Kiyoi H, Naoe T. FLT3 in human hematologic malignancies. Leuk Lymphoma. 2002 Aug. 43(8):1541-7. [Medline]. Stirewalt DL, Radich JP. The role of FLT3 in haematopoietic malignancies. Nat Rev Cancer. 2003 Sep. 3(9):650-65. [Medline]. Levis M, Small D. FLT3: ITDoes matter in leukemia. Leukemia. 2003 Sep. 17(9):1738-52. [Medline]. Kottaridis PD, Gale RE, Linch DC. Flt3 mutations and leukaemia. Br J Haematol. 2003 Aug. 122(4):523-38. [Medline]. Naoe T, Kiyoi H. Normal and oncogenic FLT3. Cell Mol Life Sci. 2004 Dec. 61(23):2932-8. [Medline]. Kiyoi H, Yanada M, Ozekia K. Clinical significance of FLT3 in leukemia. Int J Hematol. 2005 Aug. 82(2):85-92. [Medline]. Ozeki K, Kiyoi H, Hirose Y, et al. Biologic and clinical significance of the FLT3 transcript level in acute myeloid leukemia. Blood. 2004 Mar 1. 103(5):1901-8. [Medline]. Chen W, Jones D, Medeiros LJ, Luthra R, Lin P. Acute myeloid leukaemia with FLT3 gene mutations of both internal tandem duplication and point mutation type. Br J Haematol. 2005 Sep. 130(5):726-8. [Medline]. Rombouts WJ, Blokland I, Lowenberg B, Ploemacher RE. Biological characteristics and prognosis of adult acute myeloid leukemia with internal tandem duplications in the Flt3 gene. Leukemia. 2000 Apr. 14(4):675-83. [Medline]. Meshinchi S, Woods WG, Stirewalt DL, et al. Prevalence and prognostic significance of Flt3 internal tandem duplication in pediatric acute myeloid leukemia. Blood. 2001 Jan 1. 97(1):89-94. [Medline]. Liang DC, Shih LY, Hung IJ, et al. Clinical relevance of internal tandem duplication of the FLT3 gene in childhood acute myeloid leukemia. Cancer. 2002 Jun 15. 94(12):3292-8. [Medline]. Zwaan CM, Meshinchi S, Radich JP, et al. FLT3 internal tandem duplication in 234 children with acute myeloid leukemia: prognostic significance and relation to cellular drug resistance. Blood. 2003 Oct 1. 102(7):2387-94. [Medline]. Arrigoni P, Beretta C, Silvestri D, et al. FLT3 internal tandem duplication in childhood acute myeloid leukaemia: association with hyperleucocytosis in acute promyelocytic leukaemia. Br J Haematol. 2003 Jan. 120(1):89-92. [Medline]. Xu F, Taki T, Eguchi M, et al. Tandem duplication of the FLT3 gene is infrequent in infant acute leukemia. Japan Infant Leukemia Study Group. Leukemia. 2000 May. 14(5):945-7. [Medline]. Kottaridis PD, Gale RE, Frew ME, et al. The presence of a FLT3 internal tandem duplication in patients with acute myeloid leukemia (AML) adds important prognostic information to cytogenetic risk group and response to the first cycle of chemotherapy: analysis of 854 patients from the United Kingdom Medical Research Council AML 10 and 12 trials. Blood. 2001 Sep 15. 98(6):1752-9. [Medline]. Frohling S, Schlenk RF, Breitruck J, et al. Prognostic significance of activating FLT3 mutations in younger adults (16 to 60 years) with acute myeloid leukemia and normal cytogenetics: a study of the AML Study Group Ulm. Blood. 2002 Dec 15. 100(13):4372-80. [Medline]. Wu X, Feng X, Zhao X, et al. Prognostic significance of FLT3-ITD in pediatric acute myeloid leukemia: a meta-analysis of cohort studies. Mol Cell Biochem. 2016 Sep. 420 (1-2):121-8. [Medline]. Falini B, Nicoletti I, Bolli N, et al. Translocations and mutations involving the nucleophosmin (NPM1) gene in lymphomas and leukemias. Haematologica. 2007 Apr. 92(4):519-32. [Medline]. Chen W, Rassidakis GZ, Medeiros LJ. Nucleophosmin gene mutations in acute myeloid leukemia. Arch Pathol Lab Med. 2006 Nov. 130(11):1687-92. [Medline]. Mariano AR, Colombo E, Luzi L, et al. Cytoplasmic localization of NPM in myeloid leukemias is dictated by gain-of-function mutations that create a functional nuclear export signal. Oncogene. 2006 Jul 20. 25(31):4376-80. [Medline]. Oki Y, Jelinek J, Beran M, Verstovsek S, Kantarjian HM, Issa JP. Mutations and promoter methylation status of NPM1 in myeloproliferative disorders. Haematologica. 2006 Aug. 91(8):1147-8. [Medline]. Falini B, Mecucci C, Tiacci E, et al. Cytoplasmic nucleophosmin in acute myelogenous leukemia with a normal karyotype. N Engl J Med. 2005 Jan 20. 352(3):254-66. [Medline]. Grisendi S, Mecucci C, Falini B, Pandolfi PP. Nucleophosmin and cancer. Nat Rev Cancer. 2006 Jul. 6(7):493-505. [Medline]. Hermans MH, Antonissen C, Ward AC, Mayen AE, Ploemacher RE, Touw IP. Sustained receptor activation and hyperproliferation in response to granulocyte colony-stimulating factor (G-CSF) in mice with a severe congenital neutropenia/acute myeloid leukemia-derived mutation in the G-CSF receptor gene. J Exp Med. 1999 Feb 15. 189(4):683-92. [Medline]. [Full Text]. Mitsui T, Watanabe S, Taniguchi Y, et al. Impaired neutrophil maturation in truncated murine G-CSF receptor-transgenic mice. Blood. 2003 Apr 15. 101(8):2990-5. [Medline]. Aarts LH, Roovers O, Ward AC, Touw IP. Receptor activation and 2 distinct COOH-terminal motifs control G-CSF receptor distribution and internalization kinetics. Blood. 2004 Jan 15. 103(2):571-9. [Medline]. Chou WC, Tang JL, Lin LI, et al. Nucleophosmin mutations in de novo acute myeloid leukemia: the age-dependent incidences and the stability during disease evolution. Cancer Res. 2006 Mar 15. 66(6):3310-6. [Medline]. Dong F, Brynes RK, Tidow N, Welte K, Lowenberg B, Touw IP. Mutations in the gene for the granulocyte colony-stimulating-factor receptor in patients with acute myeloid leukemia preceded by severe congenital neutropenia. N Engl J Med. 1995 Aug 24. 333(8):487-93. [Medline]. Thiede C, Koch S, Creutzig E, et al. Prevalence and prognostic impact of NPM1 mutations in 1485 adult patients with acute myeloid leukemia (AML). Blood. 2006 May 15. 107(10):4011-20. [Medline]. Dohner K, Schlenk RF, Habdank M, et al. Mutant nucleophosmin (NPM1) predicts favorable prognosis in younger adults with acute myeloid leukemia and normal cytogenetics: interaction with other gene mutations. Blood. 2005 Dec 1. 106(12):3740-6. [Medline]. Boissel N, Renneville A, Biggio V, et al. Prevalence, clinical profile, and prognosis of NPM mutations in AML with normal karyotype. Blood. 2005 Nov 15. 106(10):3618-20. [Medline]. Hermans MH, Ward AC, Antonissen C, Karis A, Lowenberg B, Touw IP. Perturbed granulopoiesis in mice with a targeted mutation in the granulocyte colony-stimulating factor receptor gene associated with severe chronic neutropenia. Blood. 1998 Jul 1. 92(1):32-9. [Medline]. van de Geijn GJ, Gits J, Aarts LH, Heijmans-Antonissen C, Touw IP. G-CSF receptor truncations found in SCN/AML relieve SOCS3-controlled inhibition of STAT5 but leave suppression of STAT3 intact. Blood. 2004 Aug 1. 104(3):667-74. [Medline]. Ward AC, van Aesch YM, Schelen AM, Touw IP. Defective internalization and sustained activation of truncated granulocyte colony-stimulating factor receptor found in severe congenital neutropenia/acute myeloid leukemia. Blood. 1999 Jan 15. 93(2):447-58. [Medline]. Chen W, Rassidakis GZ, Li J, et al. High frequency of NPM1 gene mutations in acute myeloid leukemia with prominent nuclear invaginations ("cuplike" nuclei). Blood. 2006 Sep 1. 108(5):1783-4. [Medline]. Zhang Y, Zhang M, Yang L, Xiao Z. NPM1 mutations in myelodysplastic syndromes and acute myeloid leukemia with normal karyotype. Leuk Res. 2007 Jan. 31(1):109-11. [Medline]. Schnittger S, Schoch C, Kern W, et al. Nucleophosmin gene mutations are predictors of favorable prognosis in acute myelogenous leukemia with a normal karyotype. Blood. 2005 Dec 1. 106(12):3733-9. [Medline]. Verhaak RG, Goudswaard CS, van Putten W, et al. Mutations in nucleophosmin (NPM1) in acute myeloid leukemia (AML): association with other gene abnormalities and previously established gene expression signatures and their favorable prognostic significance. Blood. 2005 Dec 1. 106(12):3747-54. [Medline]. Port M, Bottcher M, Thol F, et al. Prognostic significance of FLT3 internal tandem duplication, nucleophosmin 1, and CEBPA gene mutations for acute myeloid leukemia patients with normal karyotype and younger than 60 years: a systematic review and meta-analysis. Ann Hematol. 2014 Aug. 93(8):1279-86. [Medline]. Wong E, Ling V, Westerman D, Morgan S, Juneja S. How unique is pure erythroid leukaemia? A retrospective analysis of seven cases and review of the literature. J Clin Pathol. 2015 Apr. 68(4):301-5. [Medline]. You E, Cho YU, Jang S, et al. Frequency and clinicopathologic features of RUNX1 mutations in patients with acute myeloid leukemia not otherwise specified. Am J Clin Pathol. 2017 Jul 1. 148 (1):64-72. [Medline]. Canaani J, Beohou E, Labopin M, et al. Impact of FAB classification on predicting outcome in acute myeloid leukemia, not otherwise specified, patients undergoing allogeneic stem cell transplantation in CR1: An analysis of 1690 patients from the acute leukemia working party of EBMT. Am J Hematol. 2017 Apr. 92 (4):344-50. [Medline]. Thuler LCS, Pombo-de-Oliveira MS. Acute promyelocytic leukaemia is highly frequent among acute myeloid leukaemias in Brazil: a hospital-based cancer registry study from 2001 to 2012. Ann Hematol. 2017 Mar. 96 (3):355-62. [Medline]. Erythroblasts of pure erythroid leukemia. Blasts of acute undifferentiated leukemia.